The Tory Party who ideologically hates the thought of giving workers any sort of rights have suddenly found a way to make employees’ rights work in their favour. They took advantage of an MP who is on maternity leave by turning her absence into a personal political gain for their party. Jo Swinson, the Liberal Democrat MP, who is on maternity leave was not able to be present at a crucial vote in the House of Commons this week. However, Jo Swinson was told that she could rely on a long standing practice in Parliament whereby an MP who is unable to attend to vote would be paired with another MP who would be held back from voting so that the two absences cancel each other out. The agreement is referred to as the ‘Pairing System’. The Tory party’s Chief whip, Julian Smith, broke the agreement by asking a Tory MP to vote in the Government’s favour, thereby NOT cancelling out Jo Swinson’s vote and bolstering the Government’s support instead. Julian Smith, it is reported, had asked a number of Tory MPs to break various pairing arrangements that night but is claiming that it was an error on his part. There are calls for Julian Smith to resign but the PM is standing by him. 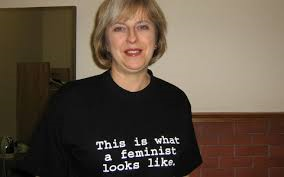 Yes, of course she would despite wearing a t-shirt sometime ago professing herself to be a feminist. Abstract feminism is a Poundland version of feminist practice whereby one can pick and mix aspects of the wider concepts to suit one’s ego-centric agenda. It is a strategy employed especially by right wing women who adorn the label ‘feminist’ only because, they think, it somehow builds a bridge with the inhabitants at large of the movement. Wearing a T-shirt, adopting a label, grabbing power and misusing it and doing the walk without the talk are hollow signifiers of feminism devoid of substance. There isn’t any essence to it is there? Give up the T-shirt please.